COMMENTARY — Wow! Going into last weekend I thought that Utah had a legitimate chance to beat Oregon, but even I did not imagine that the Utes were capable of laying down that kind of a beating on the Ducks in their own backyard. The Cambridge Dictionary defines an “anomaly” as “something that is unusual enough to be noticeable or seem strange.” For example, me driving down the street in my bright red Dodge Charger with the sun roof open and windows down blaring Barry Manilow instead of the bass thumping rap beat that normally spews out of open windows of sports cars would be an anomaly (and no, this not mere theoretical rhetoric, but rather something that regularly happens when I drive). Utah beating Oregon 62-20 in Eugene may be an anomaly, but the rest of the country is finally taking notice of the undefeated Utes. This No. 10-ranked Utah team has served notice that it has arrived in the Pac-12 and is a force to be reckoned with. While the Utes have had some big wins over the years, the blow-out game against the Ducks last Saturday night on national TV was indisputably Utah’s biggest win since joining the Pac-12. The game was still a stalemate at the end of the first quarter with the score sitting at six points apiece. Then the Utes started building momentum in the second quarter and took a 27-13 lead to the locker room at halftime. The best description I can give of the third quarter was an early Halloween in which Utah dug deep into its bag of tricks while fans feasted on the resulting treats. The Utes four third quarter touchdowns to push the lead to 55-13 effectively slammed the door on any chance the Ducks might have had of salvaging the game. As Robert Ellis Orrall so famously sang in 1993, “Boom! It was over just like that.” The fourth quarter was a mere formality that only delayed the inevitable celebration by Ute nation. I know this sounds like hyperbole, but the game wasn’t even as close as the 62-20 score might otherwise lead you to believe. What truly impressed me was that Utah was strong in all facets of the game — offense, defense and special teams. It was all about preparation and Coach Kyle Whittingham said it best. The offense is the one piece that hasn’t quite fit into the Ute puzzle for the first three games of the season. It turns out that the offense was just on a short leash early on as Utah intentionally waited to unveil the full breadth of its offensive weaponry until the showdown with the Ducks. If you don’t count Utah just running out the last 45 seconds on the clock at the end of the first half, the Utes scored on 10 of their first 12 possessions of the game (with the first two being field goals, followed by nothing but touchdowns the rest of the way). In just a little over 30 minutes of game time, starting with 4:08 left to play in the second quarter, and continuing until late in the fourth quarter with only 3:58 left in the game, Utah scored 42 unanswered points. Not only did the Utes have a balanced attack running the ball 42 times and throwing it 32 times, but they finally started airing the ball out downfield in order to stretch the defense. Utah averaged nearly 13 yards per completion and had five pass completions that gained 20 yards or more. Going into the Oregon game, Travis Wilson had yet to throw a single touchdown pass all season long. Wilson tossed four touchdown passes against the Ducks (and ran a fifth one in himself). Even Devontae Booker threw a touchdown pass out of the backfield to a wide open Britain Covey on a trick play as part of the third quarter barrage. The running game was also clicking on all cylinders as Booker finished the game with 98 yards rushing and Wilson had an even 100 (with 60 of those yards coming on a single play). The Utes averaged 6.5 yards per rush and had three running plays that gained more than 20 yards each. Notably, Utah did not commit a single turnover and did not give up a single sack the entire game. As good as the Utes offense was, the defense was just as good, if not better. Utah intercepted Oregon twice and recovered a fumble. After a slow start in the first three games that yielded only three total sacks, the Utes racked up five sacks against the Ducks. 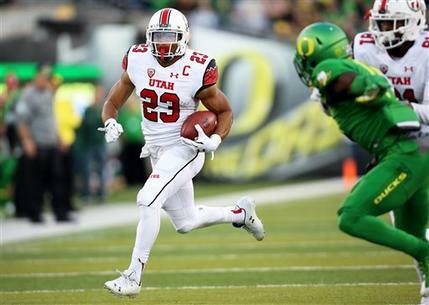 Utah’s defense was simply stifling, holding Oregon scoreless for more than half of the game. The Ducks went through three different quarterbacks trying to find someone, anyone, who could move the ball against the seemingly impenetrable wall created by the Ute defense. Utah’s special teams alone are worth the price of admission to the game. Punter Tom Hackett was simply amazing. He flipped the field in the first quarter with a career-long 76-yard punt to the Oregon 8-yard line. 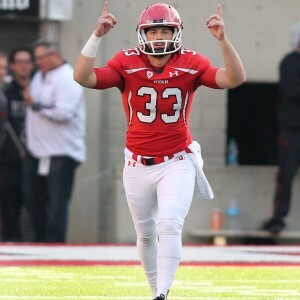 Hackett didn’t even see the field again until the third quarter, when he one-handed a high snap and ran a fake punt 33 yards to convert a fourth-and-13 from Utah’s own 28-yard line. Utah only punted three times all game and Hackett pinned the Ducks inside their own 10-yard line on all three punts. One of my favorite plays of the game was part of the third quarter bag of tricks. Oregon punted to Utah, and Britain Covey should win an Academy Award for faking his attempt to run underneath and field the punt on one side of the field, attracting the attention of virtually every Duck running downfield to cover the punt, while Boobie Hobbs actually fielded the punt virtually unnoticed on the other side of the field and ran it back 69-yards untouched for a touchdown. Here’s hoping that similar to the legend of Jerry Seinfeld’s speed only swelling to mythical proportions with his refusal to run again, Utah’s victory over Oregon will only loom larger over the coming week as the Utes have a bye and don’t play again until they host California on Saturday, Oct. 10.